Wait! Instead of throwing out that pineapple top – recycle it. A great way to continue to enjoy that delicious pineapple you just ate is to grow your own. It doesn’t take much- just time and patience. Pineapple plant is a “kitchen scrap plant” that can be started by simply rooting the crown (pineapple top) and planting it in soil. Not only will you have a decorative plant but you will also produce a sweet edible pineapple that will give you the satisfaction in knowing that you grew it yourself. It’s a great project to start with the kids! 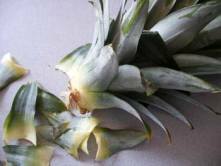 Use a pineapple top (crown) with healthy, unbruised leaves. Twist or cut off the spiky top of the pineapple. Peel off about a fourth of the lower leaves to expose the stem. You will see small brown bumps that will eventually become the roots (root primordia). Leave the pineapple top in a shaded area on the kitchen counter to dry for several days and then plant it in 6 inch pot with well-drained soil. You can brush rooting hormone on the bottom to speed up rooting (optional). Firm the soil around the plant to secure it in place and water. Keep the soil slightly moist. If the environment is dry, enclose the potted plant inside a plastic bag to increase humidity and speed up rooting. If kept at 70F (21C) it should start to root within 2-4 weeks. 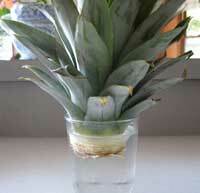 Another way to grow a pineapple crown is to root it in water. Suspend the bottom of the pineapple crown in a glass of water. Change the water every few days. Roots should emerge in 2-4 weeks. Plant the rooted crown in well drained soil and keep the soil slightly moist (not wet). Move the crown to a sunny, warm (75F) humid location with night temperatures above 65F degrees. You should see new growth in about 2 months. In drier conditions, increase humidity by misting and keeping a bit of water in the center crown. When you see new growth, feed your pineapple plant with a half strength balanced fertilizer twice a month during the summer months. Another option is to use a liquid fertilizer such as fish emulsion or seaweed. It can take several years for the plant to be ready to flower and bear fruit. The plant should have at least 25 normal sized leaves to be large enough to flower. If after 18 mos. you don’t see anything happening-place the plant in a plastic bag with two very ripe apples cut in half for a few days, this will release ethylene gas which will triggers their blooming stimuli. In 1-2 months you should see a red spiky bud followed by blue flowers in the center of the plant. This process can take 2-3 years but it’s worth a try just to have a novelty bromeliad to enjoy. 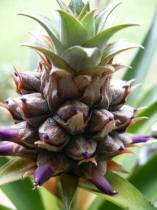 When pineapple plants are forced to bloom too early the young plant will produce smaller fruit. For larger fruit it’s best to have a minimum of 40 mature leaves 18 inches long. My pineapple plant just fell over and the stem broke but is still slightly attached can it be saved or do I need to cut the pineapple off? Please help! You’ll have to cut it off and place the stem in water. I don’t think it will continue to grow. Hi I’m I’m North Pole alaska. We planted two pineapple tops from Maui gold’s 20 months ago. Indoors of course. Recently the bottom leaves on the plants have turned yellow/brown. In the winter it’s around 70-80 degrees in here and we set up a grow light because we tend to not get many hours of sun. My question is how long should we keep the light on. And what is going on with the leaves browning? They have about 20-25 large leaves on each. When can we expect fruit? Can’t wait! Kudos to you on trying to grow pineapple in the North Pole. It sounds as if you are off to a good start. The lower leaves can turn yellow/brown due to being the older leaves and getting less nitrogen. It’s pretty normal especially in the winter when there is less light. You should be fine as long as it’s growing new leaves. The important thing about growing indoors in winter is to give it as much light possible. Leave your grow light on for at least 12 hours. It will not be the same as outdoor sun but will maintain the plant during the dark days of winter. With 20-25 leaves per plant you should expect to get some fruit next season. In fact, it may produce a flower in the winter months. If you don’t see any buds by Feb., try coaxing your pineapple to bloom. Good luck, let me know what happens. I have one pineapple that I have nursed for as many as 4 years. I moved about 200 miles south early this year. The plant produced a delicious pineapple that I harvested this summer. I have planted the top and two pups. What should I do with the parent plant now? It has been a couple of years since being on this site. This was the most successful year going pineapples. Due to the mild winter I was able to produce 66 pineapples this year. Now I have over 300 plants and running out of room to plant (I have to leave some room for my 2 dogs to play). Here in Florida my plant have bloomed Jan/Feb. This year they bloomed in Dec (’11). Here is my question. Have you ever heard of pineapples flowering in Sept. in FL? I just noticed I’m going to have a new pineapple last week while cutting the grass. Welcome back, nice to hear from you. It wouldn’t be unusual for the pineapple plant to start flowering in Sept. Pineapple naturally develop flowers when days are short (10 hrs) and nights are cool (55-65). The days start to shorten after the summer solstice (June 20). Also, You may have had different growing conditions this year to stimulate earlier flowering. Wow ! You could start a pineapple company . I live in Kentucky and my plants are indoors . Our 4th pineapple since 2007 has just begun and we are so excited . It is the “child ” of the first pineapple as were the others . I’m wondering whether I should pay particular attention to soil moisture now that the “infant” is maturing . Also , our first pineapple was the sweetest but the others have been very good . I put a picture of the baby pineapple on Facebook and received many interesting comments . I live in Central Florida and have 5 pineapples in the ground ranging from 2 years to several months old. They were doing fine but now the leaves are yellowing. We had some cold weather with nights in the 40sF; and recently they have been mid 50s to mid 60s. Is the yellowing due to the temperature? They are in sandy soil that was enriched with bought compost when planting. We are in the dry season and have not had rain for a month or two, however, the soil isn’t completely dried out due to the low temps and very dewy nights. Thanks. I live in Central Florida and have 5 pineapples in the ground ranging from 2 years to just a few months. They have been growing well however the leaves have started to turn yellow. We have had cooler temps (especially at night) and I’m wondering if this will cause them to yellow. The soil is sandy, however, I added a generous amount of organic matter when planting. i have 5 pineapples with a similar problem. i will be interested to read if anyone with knowledge replies to your question. Moist. The leaves have started turning brown and I do not see any new growth. Did I kill it already help!!! There are several possibilities that can turn the leaves brown. If your plant is indoors the dry heat will do it. You may be keeping the plant too wet. Allow the top 1″ of soil to dry out before watering again. My plants are in a cool sunny room (60F) and I water them once a month during the winter; just enough to keep the soil moist. Plants grow much slower during the winter, so you may not even get any new growth until early spring. If your pineapple doesn’t improve start another one in late winter. What kind of fertilizer do I need to use on my pineapple plant to promote my plant flowering? A balanced fertilizer 10-10-10 works fine. Also see http://hortchat.com/info/growing-pineapple/comment-page-1#comment-2677 for more fertilizer discussion. I brought some pineapples back from Hawaii this summer and planted one in my garden in the back yard. I didn’t realize though I should have that they are going to be so cold sensitive. I will tey covering the plant with blankets when the cold does hit and only uncover when the sun comes out. I would however like to know what fertilizers are best and is it good to put iron on them like I do the rest of my plants? I purchased a potted pineapple plant that had already gone to fruit. I am about to pick in a day or so. My question is… once the fruit is picked what can I expect? Is the plant going to die, will it grow another one? your pineapple plant will either produce new pups from the base of the plant. These will grow into new smaller plants and each can eventually produce a fruit. A healthy, vigorous plant will produce new shoots (pups) but not always. The other option is, the mother plant will die. We have white pineapples growing.. they are the sweetest and I think they are the best. I tried white pineapple in Hawaii and they are the best!!! I don’t know why they aren’t grown for the market. Someone told me they are hard to transport. I must be extremely lucky. I have grown six pineapple plants from the fruit I have eaten. I did not follow any of the traditional steps used to grow a new plant. I cut the leafy head off of the fruit and planted in a pot with potting soil and watered it daily. Two are already producing fruit. Glenn, I did pretty much the same thing. Some of my plants are 2 yrs old but none have fruited as yet… I live in OK, where are you? I bring them in for the winters and back out for the summers. I was talking to a professional gardner and he had some very young pineapple plants that already had fruit on them. I asked him how he got them to fruit so early and he said he sprayed them with something that made them fruit more quickly. He said it was also used to get Poinsettias to bloom in Dec. He would not tell me what he was using, said it was a professional secret. Do you know what it was? It’s possible that he was using Gibberellic acid. It increases plant growth, flowering and fruiting. How can I tell when it is time to pick my pineapple? Pick the fruit when it starts to turn yellow/orange and has a slight pineapple fragrance. Cut the stem off at the bottom of the pineapple. The rest of the stalk will eventually dry up and die back. I bought a small pineapple plant @ home depot @ least 3 years ago. I put the pineapple top in water & its looked exactly the same only with very large roots. Will it grow fruit if I plant it in dirt now? In response to the question of growing oranges, or any other citrus from seed, it will grow the plant, but will not likely fruit, at least not for many years. Same is true with many fruit trees, including one of the most popular pit seeds to germinate, which is the avocado. Also, many fruit trees occurring (volunteers)naturally, will need both sexes in relatively close proximity to produce fruit. Most citrus trees that I know of that are locally/privately grafted here in central Florida, at least by the old timers I know, use the root stock from lemon. Thanks for the info. They make nice houseplants but don’t expect any fruit. Yes, it makes a difference where you keep the pineapple top. Keep it out of direct sun in filtered light. If you don’t see any new roots, then I would start over. Cut your mango off center-down the middle. Your knife will go along the one side of the pit and then do the same for the other half. You’re welcome. Have fun with your pineapple plant. If it doesn’t work the first time, don’t be discouraged, try again. No, it doesn’t matter. It seems to work both ways. The reason you leave it to dry is to form a callus from where the roots will form. can you grow oranges from the seeds we just bought sugar baby oranges they are so sweet and delicious is it possible? I have planted lemon and tangerine seeds and they make an attractive container plants. As far as whether they will produce fruit? I’m doubtful. Container grown lemons are grafted on the hardier root stock to produce fruit. It’s worth a try. If they do produce fruit, it may not be the same flavor etc., esp. if sugar baby oranges are a cross or hybrid. Maybe someone out there has had some experience with this. Many have had good luck with growing pineapples is Fla. Once the plant is done bearing fruit, it can grow another smaller fruit from any pups sicker or shoots the mother plant produces. For more info see some of the comments above for growing pineapple in FLA.
Well my Maui Gold Pineapple is almost two years old now, so I’m getting excited to see the shoot coming out the with budding flowers. It is four feet across and three feet tall. It is so big because it is right next to my compost pile. One of my plants died with root-rot and a dead heart. The one that had two babies growing out of it, the mother plant died long ago, but I finally pulled the babies off. Gave one to a friend who said that it is getting big and fast. The second baby after letting it get some more roots in a jar of water, I just put back into the ground today. My other two Tropical Gold Pineapple plants are doing very good as well. They are not so big as my Maui Gold, but they are very healthy. Great news. My pineapple is also in bloom. how long does it take to grow pineapple from seed. I make smoothies and i have found seeds in the bottom of the cup and thought about planting them but it seems as if it would take a lot longer to grow from seed. Yes, it will take a lot longer. It can take up to 6 months for the seed to germinate and it may not produce the same original plant. It’s much faster and easier to propagate vegetatively. If you want try growing from seed, make sure you nick the seed, plant is well drained soil and keep the soil moist at at temperature of 75-80F. I potted a pineapple top in April and it has sprouted three new plants. I will need to move the plant inside as it is too cold in N. Fl. to leave outside. Should I seperate the slips now or wait until spring? We had a baby pineapple get knocked off it’s momma- I am thinking I should just lopt the fruit off and plant the top. Anyone done this before? I have tried it and it works. After I ate my pineapple, I took the friut top and planted it. It is now a healthy full size plant. I live in the Texas panhandle and just planted a pineapple this spring. It already has 12 to 14 inch leaves. We’ve kept it outside all summer and now that fall is here I’m not sure when I should bring it in. Do pineapples survive if planted outside in Texas? Pineapple tolerate temperatures of 50F. even lower for short periods of time. They are tropical plants. People have had success in growing them outside in south Florida. Try mulching around the plant during the coldest part of winter and give it added protection if temperatures drop in the 40’sF. If its in a container move it indoors (garage) during a cold spell. I decided to do somthing diiferent then facebook lol, so I planted my first pineapple! I live in Ocala Florida is there any good advice for how i should care for the pineapple over time? Iv’e seen people comment saying they Re-pot theres every so often. how often should i Re-pot? Some people actually grow their pineapple in the ground and protect it if there is an eminent frost. That would be the easiest way. Plant it in full sun, with well-drained soil. If you choose to grow them in a pot, then repot once a year depending on how fast they grow. I would think in FLa. they will grow quickly. I repot mine every 1-2 yrs depending on how well its growing. If it is slow, then I repot just to get fresh soil and see what going on with the roots and soil. Mother Nature threw me a curve ball this year. Pineapples started blooming in late March early April here in FL so I figured they would be ripening about Sept. To my surprise they started ripening about mid July. They have been so sweet. I have 30 this year and so far we have eaten 10. I’m hoping to have 200 plants in the ground by the end of the summer. I have 178 as of right now. Hope everyone else is enjoying the fruits of their labor as much as I am. How far south are you in Florida? I am growing pineapple in northern Florida and bring them in each winter. They haven’t produced fruit so I am trying to induce fruiting by placing them in plastic bags with cut up apple. Have you found success with this method? Yes, I have tried it and it works. Make sure the apple is ripe and leave it with the plant for a few days up to a week. Just plant the seed in a location that has a North South breeze and at least 8 hours of sunlight. Or you can start it in a pot of soil similiar to what you are doing with the Mango.Another option is to buy a seedling from Home Depot. I paid $19 for my tree back in 2000. I’m so glad we don’t have such humidity here. Bananas are great. I am growing my first mango from a mango pit/seed. It just sprouted it’s first leaf. I gotta do something while I wait another 2+ years for another pineapple to grow. Did you do anything to the mango pit to get it started. How long did it take to sprout? Will high humidity affect the taste of the pineapple? I would like to grow a mango but I need to know how big they get? I donâ€™t think soâ€¦itâ€™s pretty humid in Hawaii and Florida were the pineapples come from in the US. Iâ€™ve seen small mango trees and large mango trees. Some say you can grow it in your house, but others say they get too large. Iâ€™m just doing it for fun. If it bares fruit Iâ€™ll be happy. Okay. I have a mango on hand. You should try your hand at peaches. Looks like it won’t let my last post be listed because of a link. I used a website for how to grow a mango tree, but ended up with trial and error. I’ve tried it the way they say taking the husk off and planting the lima bean like seed inside and it’s worked, but I also opened the husk without taking the seed out and it took. Just put it in the dirt and see what happends. This is the first time I’m growing pineapple in Missouri. I put two tops in a rectangular flower box back in May as an attempt to lure squirrels away from my tomato and other plants. Back in June I noticed that the tops haven’t turned brown but instead show new growth. Are there any hints on keeping the plants alive in winter. Such as lighting,amount of water,and temperature? When is it time to repot? You will have to bring the plant indoors for the winter as they will not survive the cold. Place it in the brightest light in the house and water less keeping it on the dry side during the winter. They grow best at temps between 68-86F. Do not fertilize in winter. Make sure it is in good well-drained soil. You can repot in spring. I have several plants started in pots and want to plant them in the ground. How far apart should they be? I live in FL but a little far north but want to try anyway. Plant your pineapple plants at least 24″ apart to allow room for growth. I started to grow my pineapple plant about 3 years ago. It finally starting to produce fruit…in March and the pineapple is about 3 inched not including the top. I read that it takes 10 months for the fruit to mature. Is my pineapple just a baby one or will it stay little. Depending on how large the plant is, it may end up being a small pineapple . Does it look like its growing or just staying the same size? At any rate, you will know how large when the pineapple starts to turn yellow. Even a small pineapple is delicious! Thank you so much…it has grown, but as of 7.21.10…we had a theif steal rip it right off the plant. I am so bummed. I have some new growth…so i figure in about 2.5 years I will see another one and will have to wait and see just how delicious it could have been. I repotted mine every spring. I also grow plumeria and ended up using the same type of soil (cactus succulent soil) and itâ€™s been great.